Nanostructured materials is one of the hottest and fastest growing areas in today's materials science field, along with the related field of solid state physics. Nanostructured materials and their based technologies have opened up exciting new possibilites for future applications in a number of areas including aerospace, automotive, x-ray technology, batteries, sensors, color imaging, printing, computer chips, medical implants, pharmacy, and cosmetics. The ability to change properties on the atomic level promises a revolution in many realms of science and technology. Thus, this book details the high level of activity and significant findings are available for those involved in research and development in the field. It also covers industrial findings and corporate support. This five-volume set summarizes fundamentals of nano-science in a comprehensive way. The contributors enlisted by the editor are at elite institutions worldwide. Researchers, scientists, and engineers in the areas of chemistry, physics, electrical engineering, and materials science. Volume 1: Synthesis and Processing. H.G. Jiang, M.L. Lau, V.L. Telkamp, and E.J. Lavernia, Synthesis of Nanostructured Coatings by High Velocity Oxygen Fuel Thermal Spraying. K.E. Gonsalves, S.P. Rangarajan, and J. Wang, Chemical Synthesis of Nanostructured Metals, Metal Alloys, and Semiconductors. J. Costa, Nanoparticles from Low-Pressure and Low-Temperature Plasma. C.D. Johnson, M. Noh, H. Sellinschegg, R. Schneidmiller, and D.C. Johnson, Kinetic Control of Inorganic Solid State Reactions Resulting from Mechanistic Studies Using Elementally Modulated Reactants. E.J. Gonzalez and G.J. Piermarini, Low Temperature Compaction on Nanosize Powders. W.H. Weinberg, C.M. Reaves, B.Z. Nosho, R.I. Pelzel, and S.P. denBaars, Strained-layer Heteroepitaxy to Fabricate Self-assembled Semiconductor Islands. J.J. McClelland, Nanofabrication via Atom Optics. K.C. Kwaitkowski and C.M. Lukehart, Nanocomposites Prepared by Sol-Gel Methods: Synthesis and Characterization. Q. Yitai, Chemical Preparation and Characterization of Nanocrystalline Materials. D.J. Duval and S.H. Risbud, Semiconductors Quantum Dots-Progress in Processing. I.T.H. Chang, Rapid Solidification Processing of Nanocrystalline Metallic Alloys. K.L. Choy, Vapor Processing of Nanostructured Materials. Volume 2: Spectroscopy and Theory. J.M. Cowley and J.C.H. Spence, Nanodiffraction. M.-I. Baraton, FT-IR Surface Spectrometry of Nanosized Particles. P. Milani and C.E. Bottani, Vibrational Spectroscopy of Mesoscopic Systems. R.M. Taylor II and R. Superfine, Advanced Interfaces to Scanning-probe Microscopes. R. Blick, Microwave Spectroscopy on Quantum Dots. E. Meyer and R. Luthi, Tribological Experiments with Friction Force Microscopy. M. J. Yacaman and J.A. Ascencia, Electron Microscopy Techniques Applied to Study of Nanostructured Materials and Ancient Materials. K. Ounadjela and R.L. Stamps, Mesoscopic Magnetism in Metals. D.J. Whitehouse, Tools of Nanotechnology: Nanometrology. V.Gasparian, M. Ortuno, G. Schon, and U. Simon, Tunneling Times in Nanostructures. S.B. Sinnott, Theory of Atomic-Scale Friction. D. Ahn, Theoretical Aspects of Strained-layer Quantum-Well Lasers. L.R. Ram Mohan, I. Vurgaftman, and J.R. Meyer, Wavefunction Engineering: A New Paradigm in Quantum Nanostructure Modeling. Volume 3: Electrical Properties. J. Smolines and G. Ploner, Electron Transport and Confining Potentials in Semiconductor Nanostructures. M.A. Reed, J.W. Sleight, and M.R. Deshpande, Electron Transport Properties of Quantum Dots. U. Simon and G. Schon, Electrical Properties of Chemically Tailored Nanoparticles and Their Applications in Microelectronics. R.P. Andres, S. Datta, D.B. Janes, C.P. 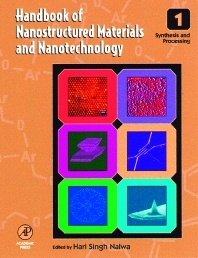 Kubiak, and R. Reifenberger, Design, Fabrication, and Electronic Properties of Self-assembled Molecular Nanostructures. T.P. Sidiki and C.M. Sotomayor Torres, Silicon-based Nanostructures. P.V. Kamat, K. Murakoshi, Y. Wada, and S. Yanagida, Semiconductor Nanoparticles. F.M. Peeters and J. DeBoeck, Hybrid Magnetic-Semiconductor Nanostructures. O.I. Micic and A.J. Nozik, Colloidal Quantum Dots of III-V Semiconductors. V.V. Moshchalkov, Y. Bruynseraede, L. Van Look, M.J. Van Bael, Y. Bruynseraede, and A. Tonomura, Quantization and Confinement Phenomena in Nanostructured Superconductors. M. Graetzel, Properties and Applications of Nanocrystalline Electronic Junctions. S. Mitsui, Nanostructured Fabrication Using Electron Beam and Its Applications to Nanometer Devices. Volume 4: Optical Properties. D.D. Notle, M.R. Melloch, Y. Ding, M. Dinu, K.M. Kwolek, and I. Lahiri, Photorefractive Semiconductor Nanostructures. F. Gonella and P. Mazzoldi, Metal Nanocluster Composite Glasses. D. Thomas, Porous Silicon. W. Chen, Fluorescence, Thermoluminescence, and Photostimulated Luminescence of Nanoparticles. V.M. Shalaev, Surface-enhanced Optical Phenomena in Nanostructured Fractal Materials. V.I. Klimov, Linear and Nonlinear Optical Spectroscopy of Semiconductor Nanocrystals. S. Vijayalakshmi and H. Grebel, Nonlinear Optical Properties of Nanostructures. S.S. Li and M.Z. Tidrow, Quantum Well Infrared Photodetectors. W. Tan and R. Kopelman, Nanoscopic Optical Sensors and Probes. Volume 5: Organics, Polymers, and Biological Materials. P.J. Stang and B. Olenyuk, Transition-Metal-Mediated Self-Assembly of Discrete Nanoscopic Species with Well-Defined Shapes and Geometries. M. Gomez-Lopez and J.F. Stoddart, Molecular and Supramolecular Nanomachines. A.C. Benniston and P.R. Mackie, Functional Nanostructures Incorporating Responsive Modules. A. Archut and F. Voegtle, Dendritic Molecules: Historical Developments and Future Applications. P.M. Ajayan, Carbon Nanotubes. J. Sloan and M.L.H. Green, Encapsulation and Crystallization Behavior of Materials Inside Carbon Nanotubes. H. Kasai, H.S. Nalwa, S. Okada, H. Oikawa, and H. Nakanishi, Fabrication and Spectroscopic Characterization of Organic Nanocrystals. G. Liu, Polymeric Nanostructures. B. Wessling, Conducting Polymers as Organic Nanometals. E. Nakache, N. Poulain, F. Candau, A.M. Orecchioni, and J.M. Irache, Biopolymers and Polymers Nanoparticles and Their Biomedical Applications. T. Bayburt, J. Carlson, B. Godfrey, M. Shank-Retzlaff, and S.G. Sligar, Structure, Behavior, and Manipulation of Nanostructure Biological Assemblies. T.M. Cooper, Biomimetic Thin Films.